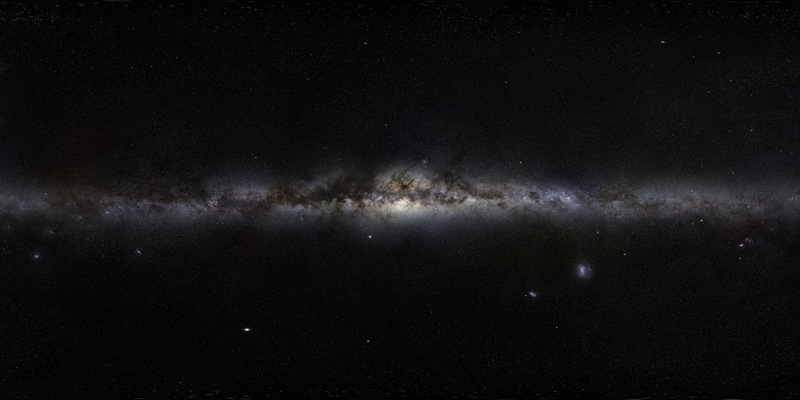 Our magnificent Milky Way Galaxy sprawls across this ambitious all-sky panorama. In fact, at 800 million pixels the full resolution mosaic strives to show all the stars the eye can see in planet Earth’s night sky. As part of ESO’s Gigagalaxy Zoom Project, Serge Brunier recorded images with a digital camera over several months of 2008 and 2009 at exceptional astronomical sites—the Atacama Desert in the southern hemisphere and the Canary Islands in the northern hemisphere. The individual frames were stitched together and mapped into a single, flat, apparently seamless 360 by 180 degree view. The final result is oriented so the plane of our galaxy runs horizontally through the middle with the bulging Galactic Center at image center. Below and right of center are the Milky Way’s satellite galaxies, the Magellanic Clouds. The Andromeda galaxy is just below center about 1/6 of the way from the left edge. Also visible are bright planets (with spikes around them) and even a comet.